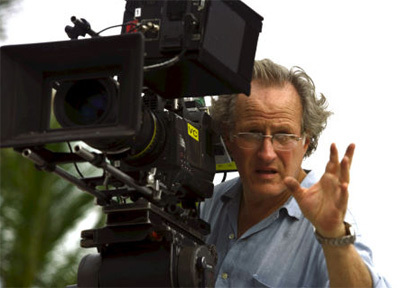 As you’ll see on this blog, I won’t make any secret about Michael Mann being my favorite director. I consider The Insider to be one of the greatest films every made and Heat to be a work of brilliance. I enjoy watching any film by Mann, even if other people don’t consider them very good. The reason for this is that one of the things I enjoy most about Mann’s work is his aesthetic. I just love the way he shoots his movies. He has a very modern aesthetic that has only become more obvious since he began using HD cameras, beginning with a little bit in Ali, shooting about 80% of Collateral with it, and finally shooting all of Miami Vice on video. So, I was really curious when I heard Mann’s next film Public Enemies, a 1930’s period piece about John Dillinger, and that he’s be shooting on HD. Check out the trailer to Public Enemies. Back in college, I shot a short film called A Soldier’s Farewell, a 1940’s period piece, that we ended up shooting on an XL1s (we didn’t even have 24p at the time!) to save money because I couldn’t afford film. The images look great (you can see a trailer for the film on my website) but one of the things we started noticing when we looked at it on a television screen what that the video made the piece feel very modern. It looked too new. And I came to the conclusion that it would be difficult to pull off a period piece with a video look. Something about it just doesn’t look right. So, I was interested to see if Mann would continue his modern aesthetic or revert back to the look he used on Last of the Mohicans. I got the opportunity a few weeks ago when Travis and I went to a test screening of the film in Sherman Oaks. He did and I have to say I was a little disappointed. Some of the images looked amazing and really worked and others looked like something you’d see in a “re-enactment” or like he took some video from behind-the-scenes footage and cut it in. It has a very video look. Sure, Miami Vice was shot on HD 24p but still looked like film. This was literally video. And it didn’t look very good. Aside from the frame rate, the film also suffered from Mann’s aesthetic. It took me out off the film. What works with a contemporary setting just did not work with a historical one. It felt like a bunch of people playing dress up. Now, this was an early screening and it was probably digital projection (which will only enhance the video look) rather than on film (which will help hide it, since the image HAS to become 24fps). I’ll see it again when it comes out to see if anything’s different and maybe my opinion will change, we’ll see. But I thought it was an interesting point to bring up: reconciling a very modern aesthetic with a historical setting. Something to consider when you’re working on your own projects. After the screening, Travis and I did get to meet Michael Mann though. It was pretty awesome.